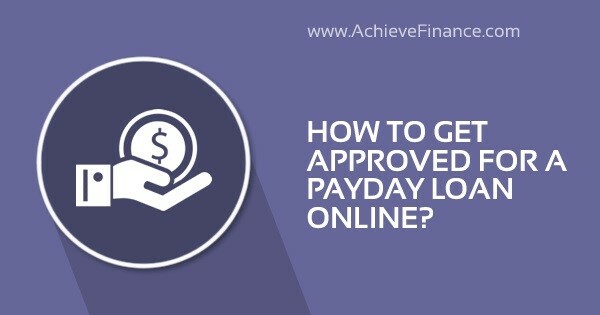 How To Get Approved For A Payday Loan Online? When facing a financial emergency where you feel there is no way out, getting approved for a payday loan can be of great help. Despite being known for their high interest rates, such loans provide quick and easy cash when in urgent financial need. This may come as a surprise, but payday loans online are in fact quite popular among specific borrowers! Generally speaking, payday loans have high approval rates when compared to conventional bank loans. Furthermore, a payday loan is typically approved within a few hours and funds almost immediately deposited into your bank account sometimes in as little as 24 hours. That all sounds great, right? Well, it’s equally important to keep in mind that many requests are in fact rejected – it all comes down to the individual criteria. Lenders will want to assess your level of risk before even thinking of providing you with a loan and one of the methods they do so is by ensuring that you can reimburse the payday loan. Moreover, the total amount of the said loan often goes hand in hand with your reimbursement capacities. You can demonstrate your ability to repay a personal loan through proof of incoming or the use of a cosigner. If you choose to go with a cosigner, make sure you are choosing a responsible individual, who has good credit score and is aware of the risks. If you fail one of your scheduled payments, your loan provider will request the sum from your cosigner. Furthermore, your cosigner will equally have to demonstrate their reimbursement capacities through proof of income. In many cases, having a cosigner can help ease a lenders worries in terms of lending to someone with a riskier credit report. When it comes to requesting a payday loan online, nothing good comes of lying. In fact and in most cases, your lender will probably discover your lie and you’ll ruin any chances of ever getting accepted for a loan in the first place. Keep in mind that your problem won’t necessarily end there – your potential lender can also warn other professionals in the field, keeping you from obtaining a loan from others as well. To avoid any of the latter problems, provide only absolute, honest and correct information in terms of your application. Your lender is guaranteed to request certain information on your behalf, including certain documentations. Make sure that all requests are fulfilled in a timely manner, including providing the requested papers and forms. Your loan application process depends on such documents, and such can be delayed or stopped altogether if you fail to fulfill requests on time. Read the loan application carefully and be sure to attach all requested documents. Even after this is completed, it is still possible that your lender requests additional information and this too has to be provided as quickly as possible. Alright, before you start freaking out – no, your credit score isn’t the biggest factor when it comes to obtaining a payday loan. But let’s face it – a positive credit rating can definitely go a long way. When it comes to a lender, you know they’re performing credit checks – even if advertising that credit and ratings don’t matter. As you know, a higher credit score increases your chances of approval so, keep an eye on your credit report, reimburse due payments, dispute any errors and keep your score above 760. Above and beyond this number, you can rest assured knowing that your report is in good shape. However, anyone under the 490 range has some work to do – for this score is considered rather negative. So, you’ve got a bad credit score: 490 and under. Don’t panic. A bad credit score can actually be improved within the matter of months if you work towards bettering it in the right way. Start by paying down debt, paying all your bills on time and maintaining low credit balances. Of course, this takes a little time and a lot of commitment, but is definitely doable if you give it what you’ve got. More so, keep in mind that although it’s best to work on improving your credit score before requesting a payday loan, sometimes emergency situations have it so that this isn’t possible. Obtaining a loan is still possible with a low credit rating, despite being slightly more difficult. As earlier mentioned, a poor credit score doesn’t impede you completely from obtaining a payday loan. In a financial emergency, you probably won’t have the needed time to improve your credit score and therefore, you’ll have to start searching for lenders that work with clients having a bad credit rating. Every payday lender has their own set of requirements and many of them aren’t set in stone. In other words, certain lenders might not consider an applicant with a score of 600 and under while another lender will, as long as you can demonstrate repayment capacities. Make sure you aren’t getting yourself into more trouble by falling into the hands of a loan shark. Always request payday loans from reputable and credible agencies. If you’re looking to increase your chances of payday loan acceptance, then take the time to verify your debt to income ratio and request a reasonable loan. For example, if your total monthly income ranges around $2000, no lender will approve a $1000 loan. In fact, you’ll greatly increase your chances of acceptance if you’re only requesting a fraction of your income, in this example, perhaps $200 or a maximum of $400. Simply remember, the lower the request, the higher the chance. In the end, when it comes to applying for a payday loan, there are many factors that come into play and many of such can increases your chances of acceptance. Keep in mind that lying for any matter in terms of your request won’t improve your chances – nor will lying about or exaggerating your monthly income. You’ll have to demonstrate stable income and therefore, part-time or freelance work is usually not taken into consideration. Can I Get A Payday Loan After Bankruptcy? How To Protect Yourself From Payday Loan Scam Calls? Why Do You Keep Getting Denied For Payday Loans Online?